If you are hosting an outdoor event and want some good, old-fashion family entertainment, look no further! Captain Token, the Magician! 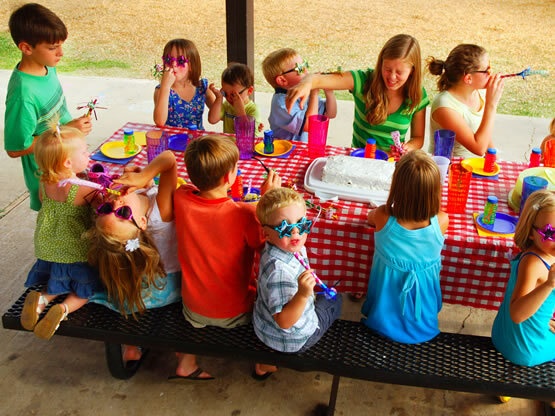 has provided unique and fun-filled outdoor parties for many years. Our games package is incredibly popular, and includes all supplies! Free-for-all using hundreds of water balloons! We can also provide face painters if you want another way to get everyone in a festive mood! In addition, pool parties are another great entertainment option. Captain Token, the Magician! can have a group of kids stand on him from neck to ankles 3 feet deep at the bottom of a swimming pool from 1 to 1 1/2 minutes. He then lifts them off when he comes up for air! He can also do a dead man’s float for over 2 minutes AND teach kids how to double THEIR Dead Man’s Floating time. Watch as Captain Token, the Magician! shoots young kids high into the air doing back dives into 4-5 feet of water! From magic shows to outdoor games packages to pool party entertainment, Captain Token, the Magician! will make your next outdoor party a magical experience. Creating the perfect party has never been so easy.